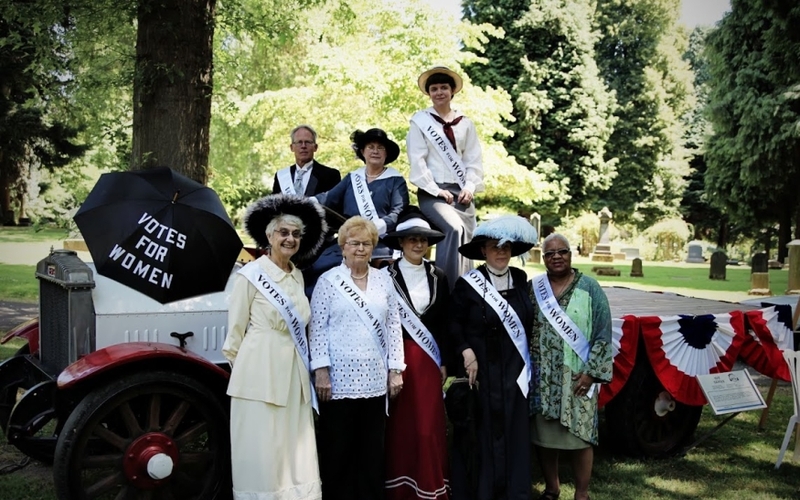 The Oregon woman suffrage movement before 1912 had a great presence in Portland. 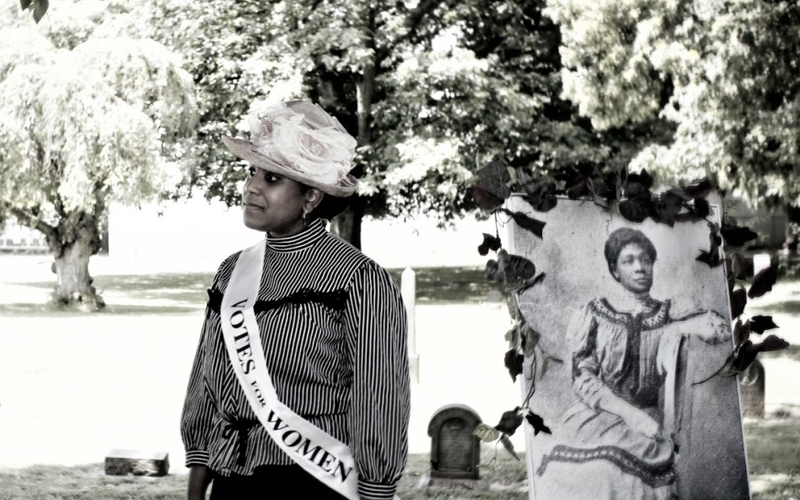 As Kimberly Jensen demonstrates in “Woman Suffrage in Oregon,” with a sixth election with suffrage on the ballot coming up in 1912, groups like the National American Woman Suffrage Association, Men’s Equal Suffrage League, a group for African Americans, the Chinese American Equal Suffrage League, and others, began to form and take hold in the city. 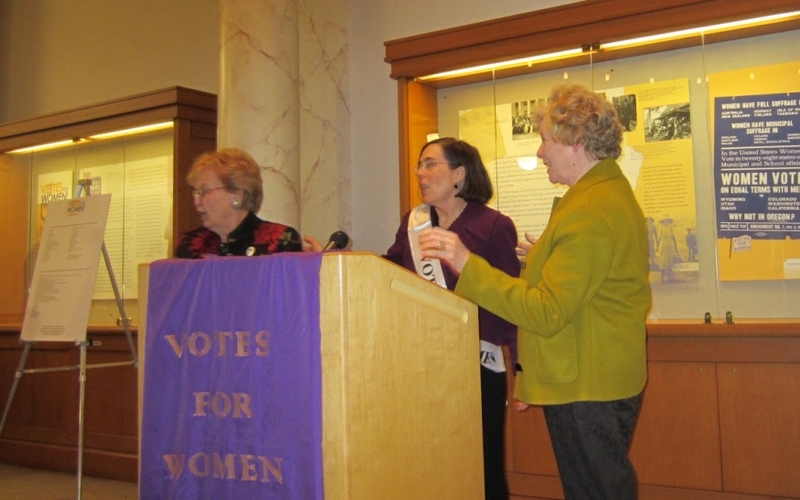 Jensen in “Neither Head Nor Tail to the Campaign” discusses another group to form in Portland in 1912, which was the Portland Equal Suffrage League with direction from Josephine Mayer Hirsch. 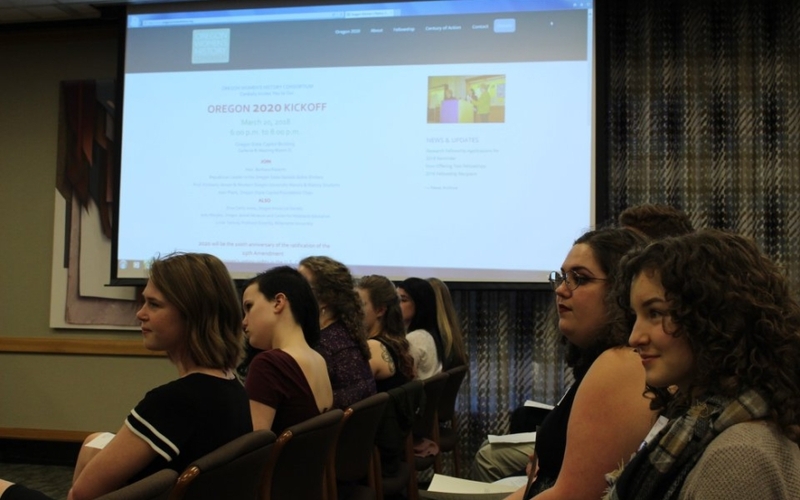 Hirsch was an active member of the Portland section of the National Council of Jewish Women and a member of the executive board of the National Council of Jewish Women (NCJW). As part of the NCJW, Hirsch was a great supporter of the Council’s Neighborhood House Settlement in South Portland. In “Creating New Citizens,” Emily Zeien-Stuckman points out that despite the public support the National Council had for woman suffrage and the obvious enthusiasm Hirsch provided, the Portland Council chose not to pick a side in the 1912 campaign. Zeien-Stuckman explains that it may be because the Portland Council thought to say nothing because the National Council had expressed its interest, but also suggests that the lack of explicit support may have been from its involvement in Neighborhood House where the emphasis was on American culture and education rather than political involvement (327-330). The Portland section of the National Council of Jewish Women’s Neighborhood House was an important institution to not only Jewish women, but also to other various communities of South Portland. Neighborhood House was founded in 1905 in response to the growing number of Jewish immigrants in Portland. It offered a large range of activities for people in the community. As Ellen Eisenberg notes in Embracing a Western Identity, many privileged Jewish women of the NCJW utilized Neighborhood House as an opportunity to work outside the home, where most of the work was community-oriented philanthropy. For these women, the settlement house was a great way to connect with other Jewish people and people in the area who were not Jewish. As a result of growing up in an area with a mix of religions and ethnic backgrounds, the new generation of Jewish women of Neighborhood House geared to a more progressive, more secular outlook, opting to not only focus on Jewish needs, but also the philanthropic needs of the community as a whole. To do this, they created programs to benefit those people in the area (91-93). Zeien-Stuckman identifies the first program of Neighborhood House as a sewing class. The class was intended for young girls and since there was such high demand for this skill, the settlement house added several classes. Many classes had up to eighty girls, where, often, less than half were Jewish, plenty were Italian Americans and others were African Americans, as those were the people to settle in South Portland (320). “State Committee is Busy,” Morning Oregonian, March 3, 1912, 18. 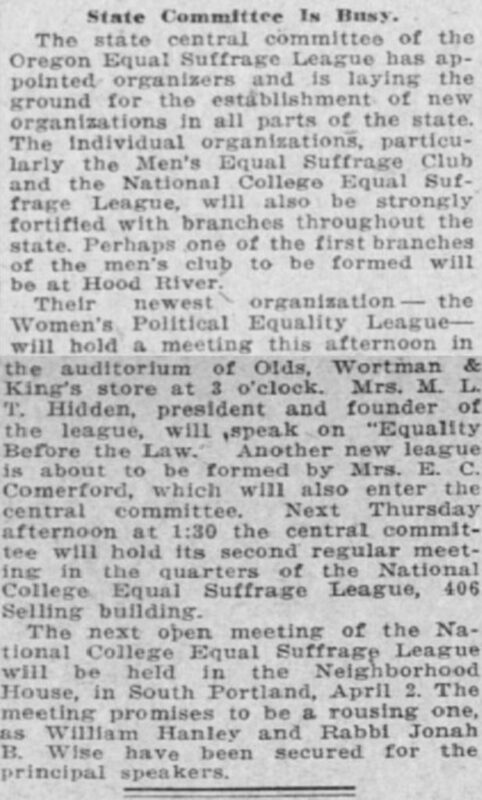 “State Committee is Busy” from the Morning Oregonian, March 3, 1912, announced an open meeting about suffrage to be held at Neighborhood House. William Harney and Rabbi Jonah B. Wise were asked to speak at the event. Since Josephine Mayer Hirsch, a major supporter of the Neighborhood House, was the director of the Portland Equal Suffrage League, it makes sense that some of Neighborhood House’s programs would be politically oriented. Because this meeting was held at Neighborhood House, people could understand the importance of woman suffrage in the context of religion. 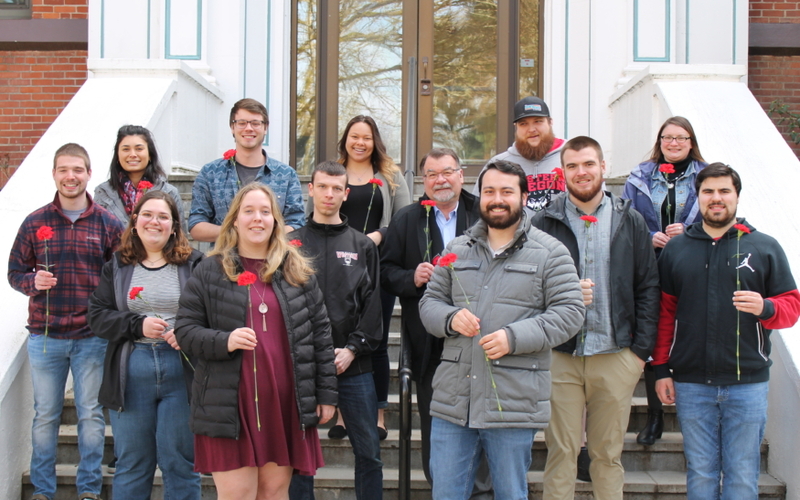 Religion is an important part of many people’s lives; it can be where people turn to for moral guidance to help them solve a problem or make a decision, so by relating religion to politics, a person can see how a particular issue, such as woman suffrage, ties into what they believe religiously. Highlighting two men who would be speaking could also be potentially beneficial because it would also showcase men’s opinions of woman suffrage. Men who were on the fence about supporting and voting in favor of woman suffrage could go listen to what Harney and Wise had to say and see that other men supported the cause. Neighborhood House was a good connecting point between politics and religion and an easy way to reach the community. “All Cost Paid By Woman.” Morning Oregonian, December 24, 1920, 16. Portland’s Neighborhood House also had many educational classes and programs. There were sewing classes, Hebrew classes, and Neighborhood House had a Kindergarten for a while. However, many of these programs and services were designed around helping immigrants “Americanize” or become assimilated and acclimated to American life and culture. As Eisenberg demonstrates, between 1878 and 1910, Portland saw an increase of 4,000 Jewish people, but between 1910 and 1927, there was an increase of 7,000 Jewish people in Portland (92). Zeien-Stuckman explains that many of the first wave of Jewish immigrants were predominantly from Germany who were more likely to be able to adapt to the American culture, but the later wave was predominantly Eastern European who were more traditionally Jewish Orthodox and had a larger obstacle to overcome given that they were generally poorer and didn’t know English (313-314). The article “All Cost Paid by Woman” from the Morning Oregonian December 24, 1920, describes one of these classes. 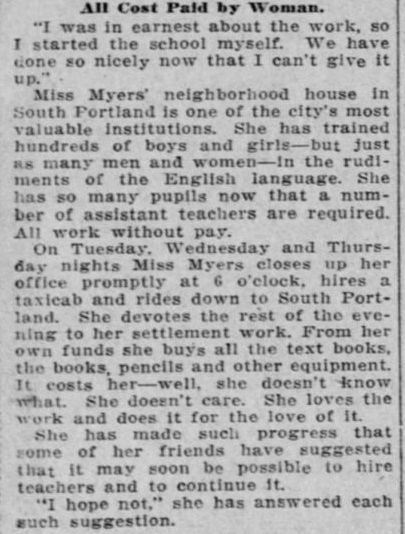 Three nights a week, Miss Myers would teach English classes at Neighborhood House. She had hundreds of students and, out of her own pocket, would buy class materials (text books, pencils, etc) just because she loved the work. Miss Myers, according to Zeien-Stuckman, was one of the most popular teachers at Neighborhood House. 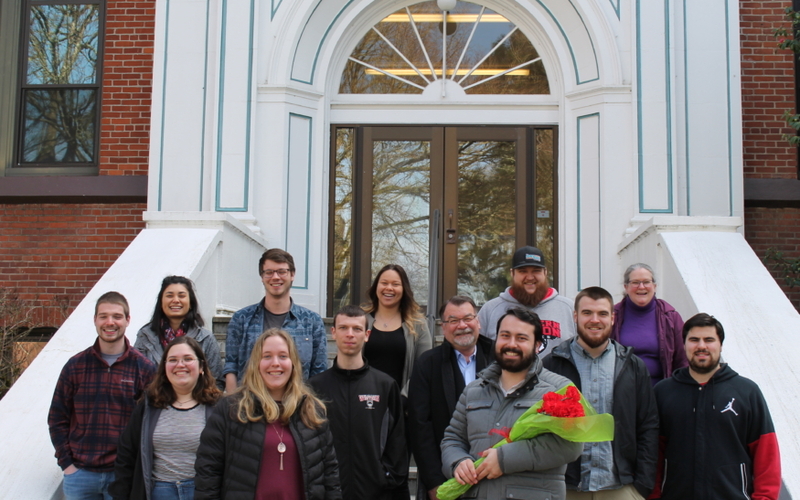 The popularity of her classes signified a demand for more immigrant-centered classes in Portland (324). Miss Myers taught an English class, but English classes were not the only ones designed for immigrants. Neighborhood House offered domestic classes, including sewing, and citizenship classes, all intended, as Eisenberg notes, to help immigrants adapt to American life (97, 108-109). It would have been very hard to become a citizen if someone didn’t know English, so the house helped with both. By creating a sense of community, Neighborhood House helped immigrants acclimate to American culture where they may have felt ostracized otherwise. “Lecture to be Tonight,” Morning Oregonian, March 31, 1915, 10. The article, “Lecture to Be Tonight” from the Morning Oregonian, March 31, 1915, explains that Mary Antin would be giving a lecture in the White Temple. Mary Antin was a Russian immigrant and author who wrote about her own Americanization in her autobiography, The Promised Land (1912). Eisenberg explains that more immigrants from Eastern Europe, including Jewish people, were moving to Portland, so, in turn, more women on the National Council of Jewish Women were from Eastern Europe (104). People were eager to hear what Antin had to say because it was so relevant in society then. Because Neighborhood House focused so much on immigrant Americanization, it holds that the NCJW and the rest of the community would also be concerned with and look forward to Mary Antin’s thoughts. It is also worth noting that this is another example of the NCJW emphasizing women’s politics. To see someone speaking about immigration is important, particularly if they are an immigrant, and notably if they are also a woman. 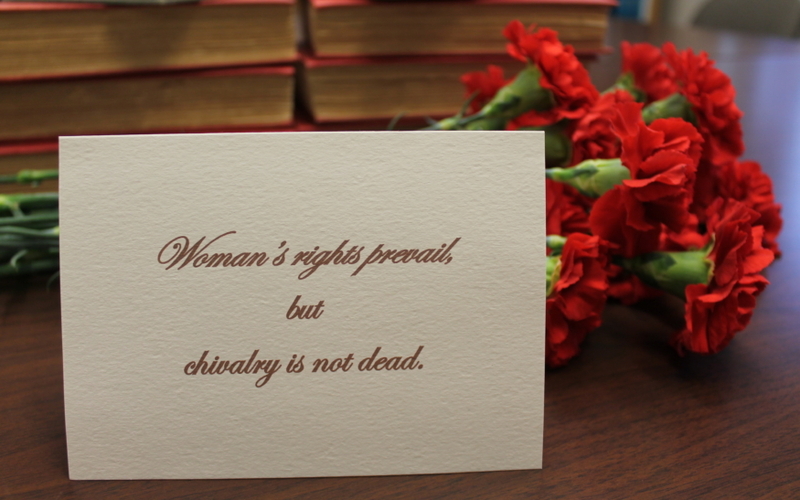 Women’s voices are so important, and the NCJW encouraged those women who wanted to step out to do that. “Women’s Activities,” Sunday Oregonian, October 3, 1920, 5. While women from the National Council of Jewish Women supported Neighborhood House by contributing financially or volunteering, members of the upper and middle class often took part in the services offered in the B’nai B’rith Building. The B’nai B’rith Building was founded in 1914, and it served as a social club for more privileged or wealthier Jewish people in Portland. People would go there to simply socialize, whereas with Neighborhood House, the main focus was charity and community work (103). 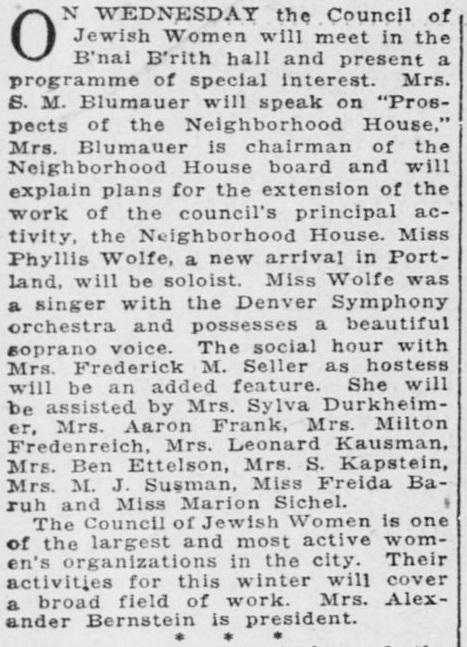 The article from “Women’s Activities” from the Sunday Oregonian October 3, 1920, informed readers of an event at the B’nai B’rith hall where the National Council of Jewish women met to discuss Neighborhood House, listened to a music performance, and socialized. In many cases there was a strong divide between German-Jewish immigrants and Eastern European-Jewish immigrants due to the strong traditions of those from Eastern Europe. German-American Jews were afraid that because it would be harder for the Eastern Europeans to assimilate to American culture, they, as highly-educated, well-off Western European immigrants, would lose their standing in society (316-317). The B’nai B’rith Building, with its popularity among wealthier Jewish people, and Neighborhood House, with its essentiality to Jewish people of lower classes, symbolized this divide in Portland’s Jewish Community. Far beyond the 1910s and 1920s, supporters of the Neighborhood House continued to work diligently to serve the ever-changing needs of their community. As Eisenberg discusses, in its beginnings, Neighborhood House held sewing classes, organized youth sports games, moving on to teach immigrants English, then worked to provide a safe space for people of color in the 1940s, and eventually moved on from being controlled by the National Council of Jewish Women (116-124). Neighborhood House still operates today helping homeless people, people in need of food, and vulnerable children and teenagers who need help succeeding in school. Without the support from the NCJW, Neighborhood House would not exist. Because members of the NCJW actively supported Neighborhood House, such as Josephine Hirsch, the settlement house was able to get the volunteers, contributions, and funding it needed to continue to provide aid and assistance to the people of their community. 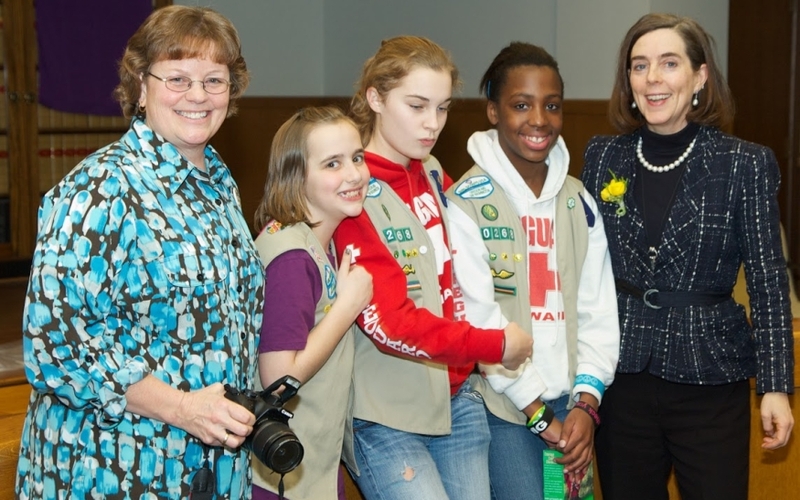 The National Council of Jewish Women and Neighborhood House have greatly helped and impacted the lives of Portlanders. 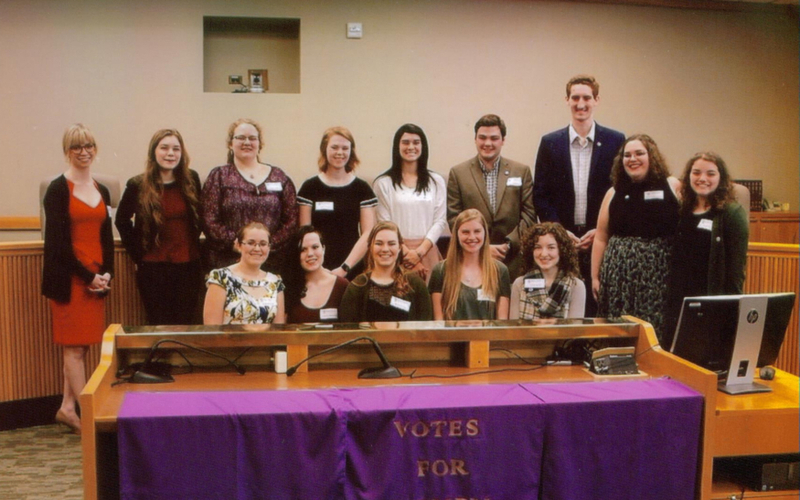 Antonia Scholerman participated in Professor Kimberly Jensen’s Winter 2018 Woman Suffrage course as a student in the Honors Program at Western Oregon University. Antonia is a History major and has a passion for gardening, music, and learning.